You deal with enough lines at Disney World. Lines for the monorail, lines to get into the park, lines to go on your favorite rides, and, too often, lines to order food at counter service restaurants. It’s our mission to keep you out of as many lines as possible. 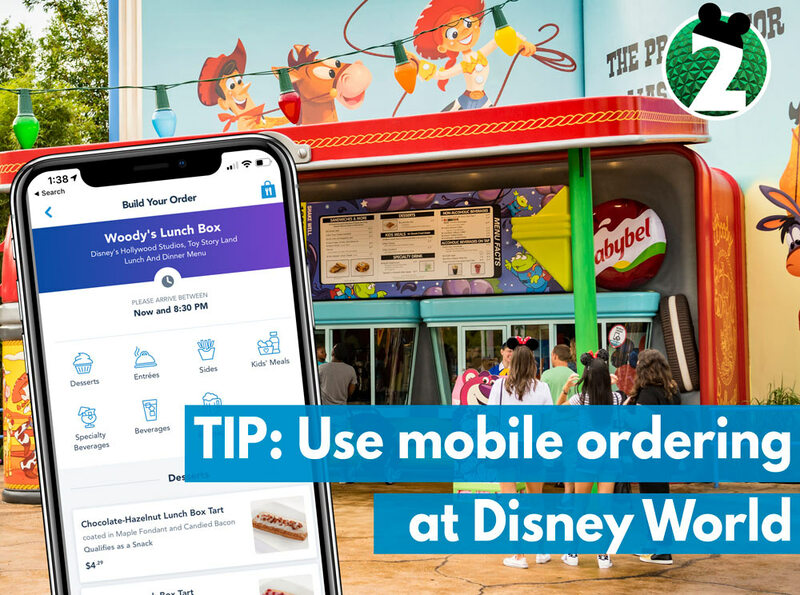 Today, we’re bringing you a tip that will help eliminate that last line from your Disney World vacation: Take advantage of mobile ordering whenever you can. Counter service dining is a great way to save time and money at Disney World. However, if you hit up a popular counter service restaurant during the lunch or dinner rush, you can kiss your time-savings goodbye. Fortunately, Disney has rolled out mobile ordering at select locations through the Disney World app. This is the same app that you can manage your FastPasses and advanced dining reservations through. Mobile ordering at Disney World lets you skip the entire counter service line and pick up your food at a specified window. Ordering is intuitive. If you’ve ever used the Starbucks or Chick-Fil-A apps to order at those restaurants, this should feel familiar. Just use the Disney World app to select a restaurant, input your order, and let the restaurant know you’re ready to pick up your food. This way you can order lunch at Cosmic Ray’s while you’re in line for Space Mountain. You can order your Dole Whip while getting seated at the Enchanted Tiki Room. You can order dinner at Woody’s Lunch Box while you zip through the FastPass line for Slinky Dog Dash. You get the idea. To take full advantage of mobile ordering, make sure you have a Disney World account with a credit card linked. Most likely, you already made an account while booking your FastPasses and restaurant reservations. Once you are logged in to the Disney World app, click on the “Order Food” button in the “My Plans” section. Here, you’ll be able to select from a list of restaurants, organized by park. Select your restaurant, and then hit “Order Food” to review the menu and build your order item by item. Once you’ve selected all of your items, click “Review My Order” and then, finally, “Complete Order.” Remember: Once you are ready to pick up your order, you must hit a button to say that you are at the restaurant. This will prompt the chefs to start preparing your order as you make your way. Once you are at the restaurant, you can head to the counter with the Mobile Order Pickup sign. Let the cast member working the counter know your name and they will either bring you your food or update you on the status of your order. Tip: To maximize the time savings, hit the “I’m here” button before you get to the restaurant. I’ve done this in the past and either had my order instantly ready or just had to wait a minute or two. We love mobile ordering at Disney World, but it isn’t perfect. The mobile ordering system does not consistently provide allergy menus. My wife has a gluten allergy. 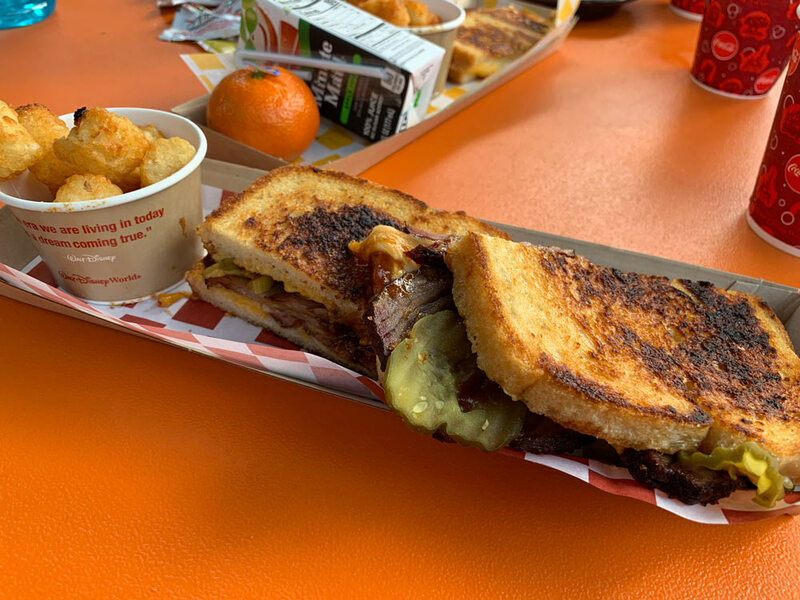 While Disney had provided a complete allergy friendly menu for mobile ordering for Cosmic Rays, the mobile menu for Woody’s Lunchbox at Hollywood Studios did not include any of their gluten-free options. We were able to wait in the regular line at Woody’s Lunchbox to order a gluten-free turkey sandwich. Hopefully Disney will fix this and always include their allergy menus in mobile ordering. Also, mobile ordering is not currently accepted at all Disney World restaurants. This ironically includes Starbucks.